What does CWN stand for? The title of my new blog. I didn't really plan to start another official blog when The Mouse Files is so fun to have on its own (and since it's so neglected - I think logic says don't have another blog). But since Cooking With Nonna is a project, and since it involves lots of photos and lots of hard work, I thought a blog might be just the thing to keep me going. 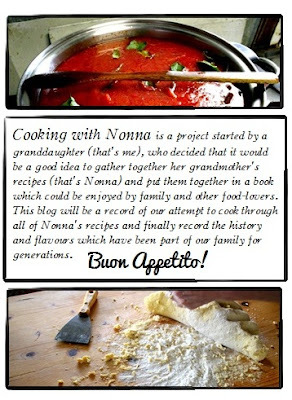 If you've read through some of my past posts you'll probably have noticed Nonna and her cooking have featured on The Mouse Files occasionally. We once made lasagna. And also some pumpkin gnocchi. So if you like cooking, and even more importantly, if you like food (and large photos of food), you had better become familiar with what CWN stands for.